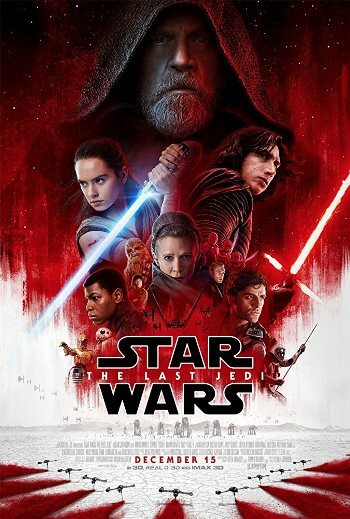 Starring Daisy Ridley, John Boyega, Mark Hamill, Carrie Fisher, Adam Driver, Oscar Isaac, Andy Serkis, Lupita Nyong’o, Domhnall Gleeson, Anthony Daniels, Gwendoline Christie, Kelly Marie Tran, Laura Dern, Benicio del Toro, Billie Lourd, Hermione Corfield, Veronica Ngo, Peter Mayhew, Jimmy Vee, Justin Theroux and the voice of Frank Oz. Distributed by Walt Disney Studios Motion Pictures. 152 minutes. Rated PG-13. There has been a significant uptick on quality since Disney purchased Lucasfilm Ltd. and took over the cash-cow, but creatively moribund Star Wars franchise, six films into the planned nine film series. (Episodes seven to nine seemed to be a semi-permanent hold with Lucas.) First came the 2015 reunion film The Force Awakens, easily the best Star Wars film since 1980’s The Empire Strikes Back. It was followed up by Rogue One, not an official part of the saga, but still a very well-made film. Back into the official nine-film story, The Last Jedi is Disney’s first step backwards. It’s not a bad movie by any means, but it’s very middling Star Wars – well under the classics like Empire, or the original Star Wars (a/k/a A New Hope), or even The Force Awakens. Still, it’s better than the prequel trilogy. It’s more on the level of the kinda good but overrated Return of the Jedi. The reins of the saga have been turned over to respected art-film director Rian Johnson, who impressed with earlier films like Brick and Looper. However, The Last Jedi has very little of Johnson’s quirky narrative eye, instead it feels like the whole thing was fleshed out strictly to stay on track of the larger saga, making this a middle segment of a trilogy which feels like one – a linking feature, not a whole individual story. This is particularly disappointing because the Star Wars series was the film that proved that a middle picture can be an artistic triumph. Empire Strikes Back is widely felt to be the best film of the first trilogy (in terms of production, if not the timeline for the series.) A second feature can be a maturing and deepening of the plot. It does not have to be a stop gap. The Last Jedi also has an elegiac feeling to it, a sense of finality to the whole project. Han Solo is dead, killed off in the last film. Mark Hamill’s Luke Skywalker is – not to give away any spoilers – left in a very ambiguous place at the end of The Last Jedi, so his return for the final film is in doubt. And while Princess… sorry General… Leia has a very substantial part here, sadly she won’t be coming back for the final movie, either. It’s no fault of the film, but the way-too-early death of actress Carrie Fisher gives her last performance as Princess Leia and her entire storyline a melancholy tone – what should have been empowering and rousing turns tragic. I’m also not sure, but it seemed like some of her role was done with CGI – which would have been a sad reality because of her sudden demise if her performance wasn’t finished – but it is still a little bit jarring to experience. Otherwise, the CGI in the film is pretty spectacular. However, after a terrific battle sequence to start things off, the film’s pace significantly sags for the next hour or so. And eventually, the battle sequences start to get a been-there/done-that feel. Perhaps it has something to do with the new characters – the next generation – who were introduced in the previous film are given little of interest to do. Only Oscar Isaac’s character turns out to be as interesting as the original trio of stars. One concerning direction that The Last Jedi makes is that it is significantly more graphically violent than previous installments in the saga. Characters are beheaded or sliced in two right on camera, giving the film more of a gratuitously gory feel than the previous movies. This is supposed to be Star Wars, not 300. However, there is enough of interest going on here – Luke’s half-hearted mentorship of Rey (Daisy Ridley), Rey’s war of wits with Kylo Ren (Adam Driver), and interesting new characters played by Laura Dern and Benicio del Toro – to give long-time fans hope for the end of the third trilogy. Also for the future of the saga, because beyond stand-alone movies like Rogue One and Ron Howard’s upcoming Han Solo origin film, Disney has recently announced they are planning on adding a fourth trilogy to the saga, beyond even George Lucas’ wildest dreams of the story. The Star Wars universe is alive and well and The Last Jedi is a perfectly decent bridge to the further adventures. I doubt it will ever become anyone’s favorite chapter of the saga, but it is entertaining, smart and shows a bright future for the franchise. Copyright ©2017 PopEntertainment.com. All rights reserved. Posted: December 18, 2017. Tags: A New Hope, Adam Driver, Andy Serkis, Anthony Daniels, Benicio Del Toro, Billie Lourd, Carrie Fisher, Daisy Ridley, disney, Domhnall Gleeson, Frank Oz, George Lucas, Gwendoline Christie, Han Solo, Hermione Corfield, Jay S. Jacobs, Jimmy Vee, John Boyega, Justin Theroux, Kelly Marie Tran, Kylo Ren, Laura Dern, Luke Skywalker, Lupita Nyong'o, Mark Hamill, movie review, Oscar Isaac, Peter Mayhew, PopEntertainment.com, Princess Leia, Return of the Jedi, Rey, Rian Johnson, Rogue One, Star Wars, Star Wars: The Last Jedi, The Empire Strikes Back, The Last Jedi, Veronica Ngo. Bookmark the permalink.